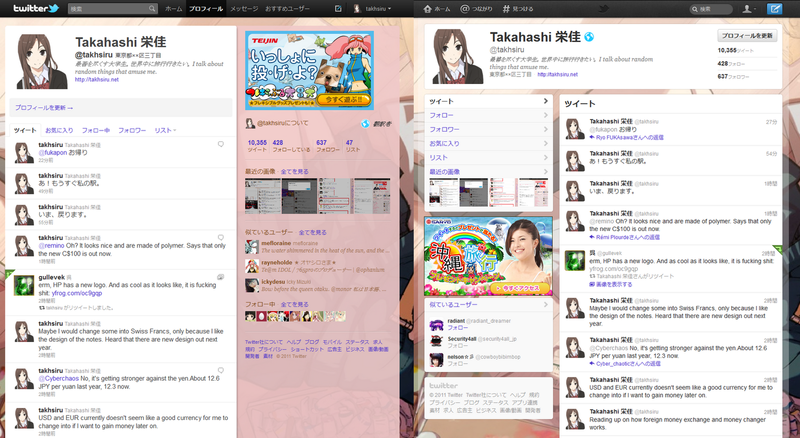 Twitter has introduced a new layout which seems to makes use of space better. Well, having the timeline to be on the right instead of the left itself could get becoming something to get used to over time. This could affect how I do things. Why is this the transition more smoothly than during the previous transition in... was it in 2010? I think there was an overall with the code, like being able to view images without opening a new page or what tweet is being replied to. The current new one just needed repositioning of things. 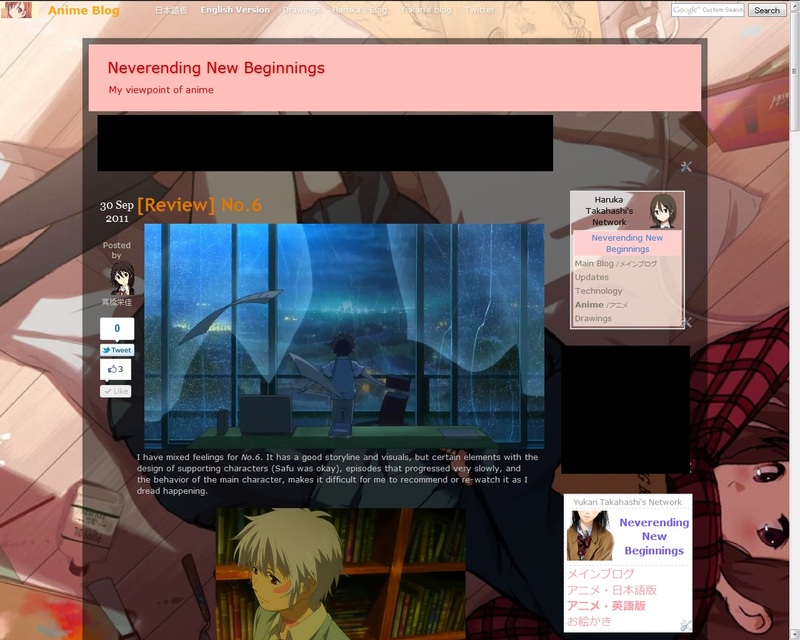 I'm about to start changing the layout of the anime blog. It currently has too much pink, and the width of the post is kind of narrow. If posting an image as large as the one seen above, the side would be squished. I'm aware of it for quite a while, but the Twitter and Facebook buttons at the side doesn't work properly, especially the latter. Background image is to be removed, but I'm compensating it with images at the header, and ones in the posts. It's been there for a while, but did anyone notice the translator badge on my profile? No one commented about it. The rough idea of writing a 6th blog story is starting to come inside my head. When I do publish it, people may ask if I've skipped a number as, if you look at the navigation menu, there's currently only no.1-4 listed, with the fifth entry listed as no.6 and might ask what happened to no.5. Well, there is a 5th story, but I'm just publishing it for a friend who asked me to put it up on my blog on their behalf. Since then, there has been no new parts written for it and I don't know what that friend is up to. In other words, it got abandoned as soon as it got published, and I'm already busy writing for story 2 and 3. So what exactly will the sixth story be about? Well, it's based on an idea of the manga I read a few hours ago. Initial plans includes an another person's point of view of Mizuho Girls' Academy, which the most recent parts of the second story is taking place in, but that doesn't really allow me to tell much about what the place.is like from a normal person's point of view. Hopefully with minimal interaction with the main characters of the older stories. The background of my main blog in English has changed to an image taken in Ikenohata, Taito-ku in Tokyo, which was the same image previously used on my Twitter profile. This has yet to be applied to the Japanese version. Thinking of what write while staring at "Footsteps of someone wearing high heels were heard, followed by the sound of the front door being unlocked." continued writing. Moved the latter part of part 67 to part 68. Published "Spring 2011 Anime Preview Part 1"
Published "End-Winter 2011 Anime Review"
Wrote and published "Spring 2011 Anime Preview Part 2"
I'm thinking of changing my current avatar as it has been in use for quite some months now, but I haven't figured out what that would be. That would at least be around December since I remembered making a santa version of it around christmas, but didn't actually use it. The avatar is a crop of a vector I did recently at around the head. Perhaps an uncropped version? (Looks at this blogs' posts) Wait, It's been 3 months since I last posted something here?